The Mary Queen of Heaven Missionaries was conceived in the very womb of the Mother of God by the power of the Holy Spirit, through ine inspiration to CorazSalazar of Manila and her six companions in the propagation of Marian devotions. Brought together by the “Hand of God”, they started to live together on April 20, 1996 as one family of the Queen of Heaven, under one Father, in the loving care of St. Joseph for a great mission of salvation. They gazed upon Mary with majestic dignity, crowned with “Triple Crown of Power, Wisdom and Love” by the Holy Trinity. They aspire to imitate Mary’s virtues through their evangelical vows of poverty, chastity and obedience, making Her their model in following the footsteps of Jesus Christ. Their commitment to “total surrender” and “endless sacrifice” enables them to embrace the “Cross of Compassion” communicated by the Savior to the Mother of Sorrows at the foot of the Cross. Through the sisters’ acts of love, their fatigue and pains which they unite with the passion and death of Jesus and the sorrows of Mary, their hearts become the altar of endless sacrifice and perfect oblation to the Eternal Father, for the coming of His kingdom and for the salvation of the world. They lived together in one heart and one soul, to be a “creation of new hope” for the destitute women of society who have become slaves of fornication and sexual perversion. With the sisters chosen by the “New Eve”, the Woman clothed with the sun (Rev. 12:1), God shall liberate these women back to Her image of unblemished dignity. Grace upon grace was bestowed them and more chosen souls from various parts of Cebu; Bohol, Pampanga and even two from California joined them. 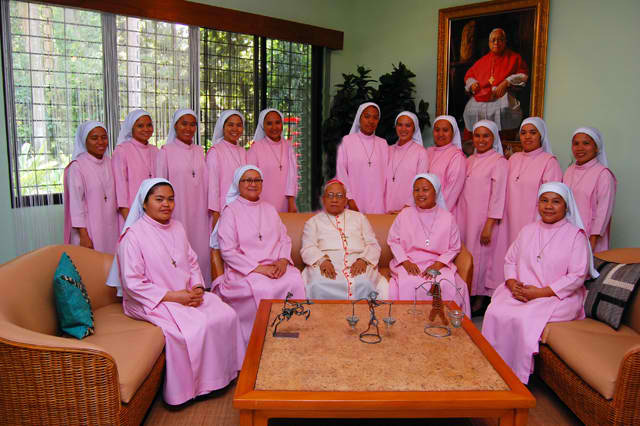 On August 4, 2000, His Eminence, Ricardo Cardinal Vidal, archbishop of Cebu formally established the Institute of Mary Queen of Heaven Missionaries as a Catholic Association of the faithful, giving his full support and fatherly guidance. On August 22, 2003, he canonically erected it as a Public Association of the Faithful, with Sr. Ma. Corazon Salazar, MQHM as Mother Foundress. Wedded to the glorious path of Christ, the sisters wholeheartedly surrendered themselves to God’s special design of salvation for the outcasts of society. They shall stand firmly in the name of truth and faith, the overflowing love and mercy of God for poor sinners. With Mary, they will search and bring back to the bosom of the Father, the lost women of Paradise. They go out at night and penetrate the “red districts”, entering bars and casas to share the filial love of God to the victims of prostitution (pick up girls, bar dancers, tourist escorts or GRO’s) and even to videoke bar waitresses. They place them under the maternal protection of Mary, giving them the powerful weapons of Mary, the Holy Rosary and the Brown Scapular with the appropriate literature and prayer guide. The sisters listen attentively to the outpouring of their problems and thirst for God. Through the miraculous touch of the “Mother of Mercy and of Holy Hope” by the warm embrace and open hearts of the sisters, their hearts and minds will be awakened and regain direction towards oneness with God’s fervent call for repentance and renewed life with Him. Armed with their trusting faith in God and with the “Crown of Power” of the Queen of Heaven, with Her angels and Her weapons of salvation (the Holy Rosary and the Brown Scapular), they shall conquer triumphantly the enemies of womanhood in the north, south, west and east of the Philippines and the whole world bringing glorious souls to God. To bring back God’s fallen children to His fold through our expression of the loving compassion of Jesus to poor sinners, especially the outcasts of society. We, the Mary Queen of Heaven Missionaries commit ourselves to make Jesus and Mary the true, living inspiration and example of our lives. We give full faith and love to the Catholic Church and promise to be faithful to her teachings, living our life in simplicity, justice, integrity and unity. We truly dedicate ourselves to help the poor sinners return to God and the outcasts of society to recover their dignity as His children. The Heart of the Good Shepherd, shared by Mary, moves us to seek the stray and fallen away and in the love of the Father that the Spirit gives, to gather them together to His Bosom so that there be one flock under one Shepherd. With Mary to unite to the sacrifice of Jesus, consumed with His love for the Father and inflamed with zeal for the return of the wayward, we give our whole life to the mission of salvation and evangelization He entrusted to the Church by the power of His Spirit. The salvation of poor sinners and rehabilitation of the outcasts of society. To rescue women and children victims of prostitution. To shelter and rehabilitate them in our Home of Love. To give them an opportunity to live a decent life, where Christ will be the center of their lives. WALKING IN THE DARK ALLEYS AT NIGHT, we rescue these poor children and women victims of prostitution. Poor children…waiting for customers to pick them up and being paid a small amount of money to augment their family sustenance.